Creative offered an unusual product - Xmod - at the last press conference held in Moscow on October 5, 2006. This new product is an external device with USB interface that can work with a computer as well as separately. Xmod contains a hardware DSP to apply audio effects. The large control allows to adjust volume, effect intensity, as well as to mute sound, when pressed. The device has the following jacks: line/mike-in and separate outputs for speakers and headphones. A special web site is dedicated to Xmod. It offers a Flash demo: www.x-fi.com. 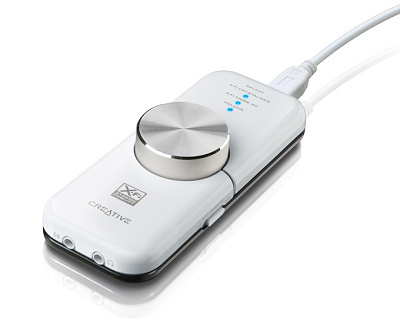 Crystalizer was described in detail in our article Creative SoundBlaster X-Fi. Part 2: Examining the 24-bit Crystalizer Technology. It's a complex combination of static and dynamic processing of a signal (a shaper, an equalizer, and a maximizer combined). It's up to you to decide whether you want to use it or not. Its use is certainly questionable for high-quality devices. In case of low-quality speakers, accented high frequencies and lows combined with compressed dynamics may sound better to some users. CMSS-3D Headphone expands the music to surround sound in headphones, CMSS-3D Virtual - in stereo speakers. There is only one difference between them - headphones don't need crosstalk cancellation. In autonomous mode the device can work only from a 5V power adapter, which is not included into the bundle. Effects are applied either to the signal that comes from a computer through USB, or from the line-in in autonomous mode, but never simultaneously. RMAA readings are good, the 44 kHz mode being a tad better. On the other hand, test results compare with characteristics of inexpensive codecs. The audio quality of Xmod is evidently lower than that of X-Fi cards, though it compares with the cheap models in price. The 24 bit 96 kHz mode demonstrates lower definition, though the codec officially supports this mode. Dynamic range and frequency response reveal the conversion. High definition formats are not for Xmod. We used the following devices for our tests: Creative HQ-1500 headphones, JB-381 speakers. As Xmod users assumably own notebooks, we evaluated the audio quality in comparison with the integrated AC'97 audio (Analog Devices SoundMAX) and Audigy2 Notebook sound card. Xmod sounded much better than AC'97 - we could hear more details and fewer distortions. Xmod was slightly outperformed by the Audigy2 Notebook (in Bit Accurate Playback mode). We compared the device under review with the X-Fi PCI card to determine authenticity of Xmod processing (X-Fi Crystalizer, X-Fi CMSS-3D Virtual, X-Fi CMSS-3D Headphone). Here emerges a question: do the X-Fi cards really need their incredible power, if these effects are successfully applied by a small all-purpose DSP. Perhaps, Creative engineers should work on better usage for the rich processing capacity of the chip installed in these cards. I remind you that according to the manufacturer, the key advantage of X-Fi cards is support for these two technologies: Crystalizer and CMSS-3D. Xmod is an interesting accessory for a notebook, which can replace the integrated audio in convenience and audio quality. 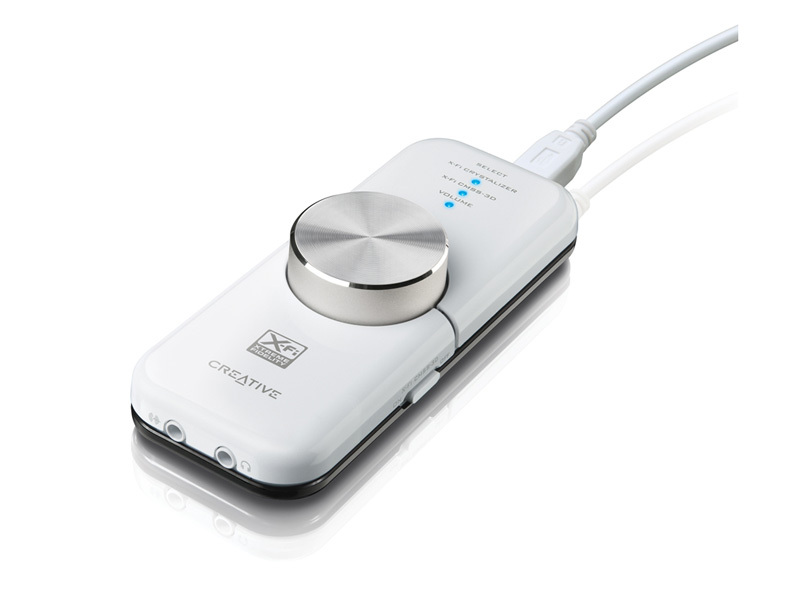 Good large digital volume control, separate outputs for headphones and speakers, built-in effects that can be disabled. Cons: no hardware support for 3D audio in games, you have to buy a power adapter for the autonomous mode, the price is rather high for our market (MSRP $80), we could buy a sterling sound card with converters of higher quality with this money. It would have been interesting for owners of sound cards to have an external device, similar to Xmod in functions, but using internal features of the PCI card.